But as different as they are, when Bennett and his mom lose their home, Mac’s got their backs. They’re family after all. Sure, it takes patience to live with the eternally smoked-out Bennett and the pill-popped Aunt Lily, but he can handle it. You know who can’t? Mac’s very pretty, very WASPy, very uptight girlfriend. So as his once-peaceful household gets completely crazy, Mac learns that wanna-be-Crips are thicker than water, that his little cousin—flawed, irreverent, and basically a Saturday morning cartoon gone horribly wrong—has become his mentor, and that he really has no idea what’s up with girls. I’ll admit, I went into Texts from Bennett with a heavy bias. Not only was I already a fan of Texts from Bennett since stumbling across it, I’ve also been a fan of Mac Lethal for a while. While I’m not the biggest fan of hip hop or rap in general, Mac is part of a fairly short list of rappers that I like. With that in mind, I can’t honestly judge whether or not I think someone would enjoy Texts from Bennett if they weren’t familiar with the man or the blog behind it. I would like to think so. 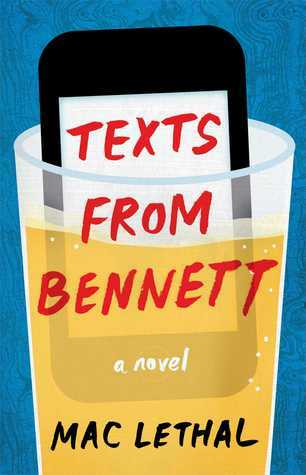 Mac writes seamlessly, alternating between first person-narrative, texts with Bennett, and side-notes with ease. Despite my bias, I still expected the text messages to make the book feel broken and cheesy, but that wasn’t the case. A lot of people, myself included, have wondered whether or not Bennett really exists. I always hoped he is a real person, and this book made me feel like he is. Not once, during the entire book, did I feel like Bennett or any of the other characters were the least bit contrived. The most charming thing about Texts from Bennett, I believe, is how deeply rooted it is into reality, but without feeling like an autobiography. It’s an incredibly entertaining yet candid view on how Mac built a relationship with his cousin and met the love his life. That’s right, there’s a bit of a love story in there. A love story that is handled with such honesty and simplicity that it might be the sweetest thing I’ve read in recent memory. That’s saying something because I read a lot of romance. If you’re a fan of the blog, Texts from Bennett, I think you’ll really enjoy this. If you’re unfamiliar with the blog, acquaint yourself and have a laugh or two. If check it out and you don’t have a laugh or two, this book probably isn’t for you.